TORONTO, Oct. 10, 2018 /CNW/ – According to a new poll from Ipsos, commissioned by ADP Canada, the changing legal status of cannabis in Canada highlights a disconnect between employers and employees, especially as it relates to when and how cannabis can be consumed at work. According to the survey, only six per cent of employed Canadians believe their organizations will allow the use of cannabis (marijuana) for recreational purposes during work hours or before coming into work. However, managers (10 per cent) are much more likely to say it will be allowed than employees without managerial responsibilities (two per cent). In fact, nearly one in five managers (19 per cent) say they are at least somewhat likely to consume cannabis for recreational purposes before going to work, and 14 per cent say it’s at least somewhat likely they will consume cannabis during work hours – vastly outnumbering non-managers, where only seven per cent said they will likely use cannabis before work, and only four per cent say they will use during work. Another cause of the disconnect between managers and employees stems from their understanding of formal policies and guidelines surrounding the use of drugs and alcohol in the workplace. While 75 per cent of managers say they are aware of such policies in their places of employment, only 64 per cent of non-managers say the same – with a further 17 per cent saying they do not believe their workplace has specified policies or guidelines to regulate drug and alcohol usage. 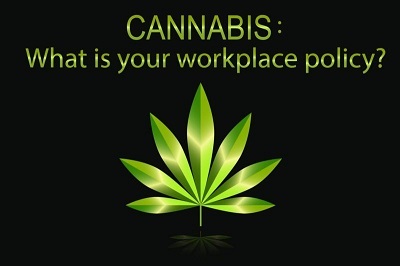 Furthermore, while 36 per cent of managers say that their organizations are introducing or revising their workplace policies and guidelines because of the impending legalization of recreational cannabis, only 13 per cent of non-managers say this is happening in their workplace – with nearly half (49 per cent) saying they are unsure if their policies and guidelines are being updated or revised. Both managers and non-managers agree that they expect to see an increase in health and safety incidents (56 per cent managers, 53 per cent non-managers) and absenteeism (43 per cent managers, 37 per cent non-managers). Similarly, both managers and non-managers expect to see a decrease in productivity (45 per cent managers, 48 per cent non-managers) and quality of work (43 per cent managers, 44 per cent non-managers). Respondents in Alberta, Saskatchewan and Manitoba (10 per cent) are the most likely to believe they will be allowed to use cannabis for recreational purposes during work hours or before coming into work. Respondents in Atlantic Canada (21 per cent), Ontario and Quebec (18 per cent) were the most likely to say their workplace has not indicated one way or the other whether they will be allowed to use recreational cannabis during or before work hours. Nearly one in five (19 per cent) respondents from Alberta and Quebec say they are at least somewhat likely to consume cannabis for recreational purposes before going to work, while 12 per cent of Saskatchewan/Manitoba and Quebec respondents say they are at least somewhat likely to consume cannabis during work hours. Nearly seven in 10 (68 per cent) say they are somewhat or very familiar with the changes to the laws related to the legalization of cannabis for recreational use and where it will be allowed to be consumed. Respondents west of Ontario are the most likely to be aware of their organization’s policies around drug and alcohol use, while those in Quebec (19 per cent) were the least likely. More than half (51 per cent) of those in Quebec say they do not believe their organization is introducing or revising its workplace policies and guidelines because of the upcoming legalization of recreational cannabis. However, respondents in Alberta (30 per cent) were most likely to say their organization is. Respondents in Ontario (45 per cent) and BC (44 per cent) were most likely to say they were unsure of their organization’s plans to introduce or update workplace policies and guidelines. These are some of the findings of an Ipsos poll conducted between September 17 and 21, 2018, on behalf of ADP. For this survey, a sample of 1,000 working Canadians (500 of whom are managers, 500 of whom are not, none of whom are self-employed) aged 18+ was interviewed online via the Ipsos I-Say panel and non-panel sources. Quota sampling and weighting were employed to balance demographics to ensure that the sample’s composition reflects that of the adult population according to Census data and to provide results intended to approximate the sample universe. The precision of Ipsos online polls is measured using a credibility interval. In this case, the poll is accurate to within ±3.5 percentage points, 19 times out of 20, had all working Canadian adults been polled. The credibility interval will be wider among subsets of the population, including managers (+/- 5 points) and non-managers (+/- 5 points). All sample surveys and polls may be subject to other sources of error, including, but not limited to coverage error, and measurement error.